We've just lowered the price on the Being There DVD. BEING THERE is based on Jerzy Kosinski’s short comic novel about a simpleton, Chance (Peter Sellers), raised in isolation whose only education came from watching TV. When he’s forced out of the house where he worked as a gardener by the death of the wealthy recluse who raised him from infancy, he fortuitously struck by a limousine carrying Eve Rand (Shirley MacLaine), the wife of a wealthy industrialist. In BEING THERE, he presents a comic fable about a man whose entire sense of reality came from watching television. Sellers is marvelous as the always-deadpan cipher in whom everyone he meets sees whatever it is they need to see. Shirley MacLaine, Jack Warden, and Melvyn Douglas give outstanding performances in this biting satire directed by Hal Ashby. ALERT: Cheech and Chong are in this film. There's a scene where Peter Sellers turns on the TV and watches a cartoon short. 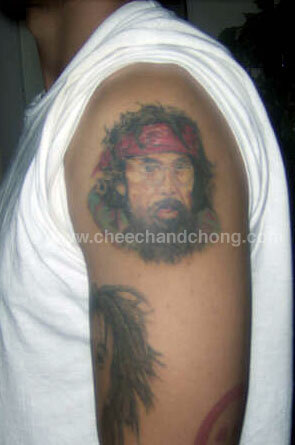 The carto on is the sketch Basketball Jones, from Cheech and Chong's infamous Los Cochinos album. This is the only place you'll see this cartoon. WE HIGHLY RECOMMEND PICKING IT UP. It's essential for C and C fans. Big price drop just announced for Cheech and Chong's Next Movie DVD. As of the time of this post, it's now only $8.99. $1 lower than Amazon. Park City, Utah...Home Of The Stars? Apparently, Park City and Deer Valley, Utah are home to many celebrities. Montel Williams, Tony Danza, Lisa Kudrow and Cheech Marin have homes there. Dustin Hoffman is currently in the market for a house. Vancouver, December 18, 2006 - Global Developments, Inc. (PINKSHEETS: GBDP), a publicly traded venture capital company, is pleased to provide the following update with respect to Helixus Productions, a movie production company with which Global has a feature documentary joint venture. Helixus Productions has completed an extensive round of interviews through Southern California to complement its first round of interviews conducted throughout mainland Europe (Cannes, Amsterdam, Hamburg, and Ibiza) and United Kingdom (London and Liverpoole). Over 40 interviews have been conducted to date for their production of "The Psychedelic Revolution", a 100-minute feature documentary and mini-series which explores the origin, flowering and long-term influence of psychedelia, a subculture that in the 1960s achieved a mass influence. Through interviews with many of its key innovators, the feature will show how revolutionary new art forms were created as an expression of the counterculture and utilized as a tool for tearing down the existing establishment. The documentary is a serious investigation of the phenomenon and long-term impact of this cultural shift. The film features interviews with many of the key innovators, as well as music, period stock footage and current footage of locations of many of the events covered in the film and psychedelic images as transitions. The film is being produced by Karl Ferris, who is recognized as the innovator of psychedelic photography. A photographer to the "British Rock Elite", Ferris was invited to create their images, costumes, look, and album covers, which he achieved, as the personal photographer to Jimi Hendrix, Eric Clapton, Donovan, Graham Nash, and the Hollies. Karl Ferris met Jimi Hendrix in 1967, and after showing him his photography, Hendrix remarked to him: "You are doing with photography, what I'm doing with music, going far out beyond the limits". Hendrix then asked Ferris to be his photographer and to re-shoot the UK version of the album Are You Experienced. rl began creating a new look for Jimi Hendrix and his bandmates, carefully designing their clothing, hairstyle, and appearance. He created the famous photograph used for Jimi's first US record album cover, which he also designed. His images appeared on all three US Album covers released during Hendrix's life, Are You Experienced, Axis: Bold as Love, and Electric Ladyland. Karl also created the album cover images for four of Donovan's albums, The Hollies' Evolution, and many others. He was also instrumental in creating their look for the shoots, which then became their recognized public image. During the years 1967-69, Karl Ferris was one of the preferred photographers to the British Rock elite, shooting many photos, as well as designing concert posters and album covers. Ferris also created a stage light show for Pink Floyd, which is believed to be the first ever stage light show in England in 1966. The film is currently on schedule for release in Summer 2007. As a pre-holiday gift to you, the first person to email us gets an Up In Smoke Club Shirt, Size Large. Before you email us, make sure you or someone you love can fit into a large. And don't forget...Anyone that places an order is automatically entered to win a Sleeping Beauty CD booklet autographed by both Cheech Marin and Tommy Chong. This is a super rare item. SORRY. GIVEAWAY IS OVER. CONGRATS TO THE WINNER. Tommy Chong posted comments on the death of Peter Boyle. The popular, but often limited, size: XXL Up In Smoke Club Shirts are back in stock. Peter Boyle died Tuesday night at age 71. He is best known for playing Raymond's dad on "Everyone Loves Raymond." He also co-starred with Cheech Marin and Tommy Chong as "Moon" in the film Yellowbeard. Tommy Chong wishes everyone a Merry Hempmas. The Cheech and Chong Dot Com Holiday Auctions Are On! 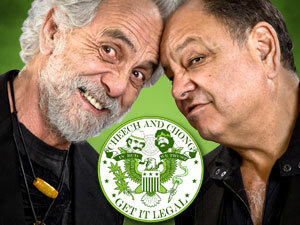 The annual Cheech and Chong Dot Com Holiday Auctions began last Saturday. Up for grabs this year are Yellowbeard on VHS, the original release of Let's Make A New Dope Deal on cassette, the super rare Santa Claus and His Old Lady 45, Up In Smoke Sdtk LP and their first album with a very unusual crown sleeve. As a pre-holiday gift to you, the first people to email us gets their choice of any of the following items we have to give away. Please specify which you'd like. It's first come, first serve. Chong Homegrown Headknocker (one of the fingers is broken). NO LONGER AVAILABLE. Chong Homegrown Headknocker (hand is broken). NO LONGER AVAILABLE. Brand new Up In Smoke Club Shirt (size Medium). It retails for $34.99. We have 2 to give away. NO LONGER AVAILABLE. Cheech Marin just returned from Hawaii where he was filming a segment for ABC-TV's Lost. Cheech will be Hurley's dad. He's on one episode which airs February 28th. 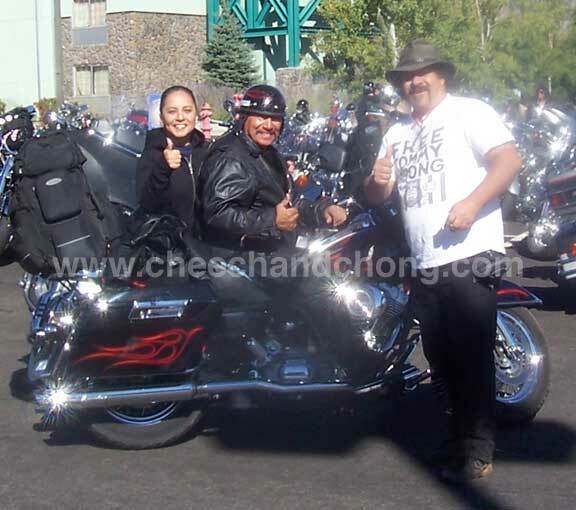 The King Of Dope, Tommy Chong, has a new post on his blog. The annual Cheech and Chong Dot Com Holiday Auctions will begin Saturday Dec 2nd. Up for grabs this year are Yellowbeard on VHS, the original release of Let's Make A New Dope Deal on cassette, the super rare Santa Claus and His Old Lady 45, Up In Smoke Sdtk LP and their first album with a very unusual crown sleeve.